Thanks to Patrick Jenkins, Jacob Birk, and the Gainesville Country Club for hosting the community tennis party! And a big thank you to the area tennis pros, Mike Oransky, Robert Taylor, Jean Vaughn, Sandra Philips, Chris McDonald, and Jason Weiss for making the tennis clinic such a success! 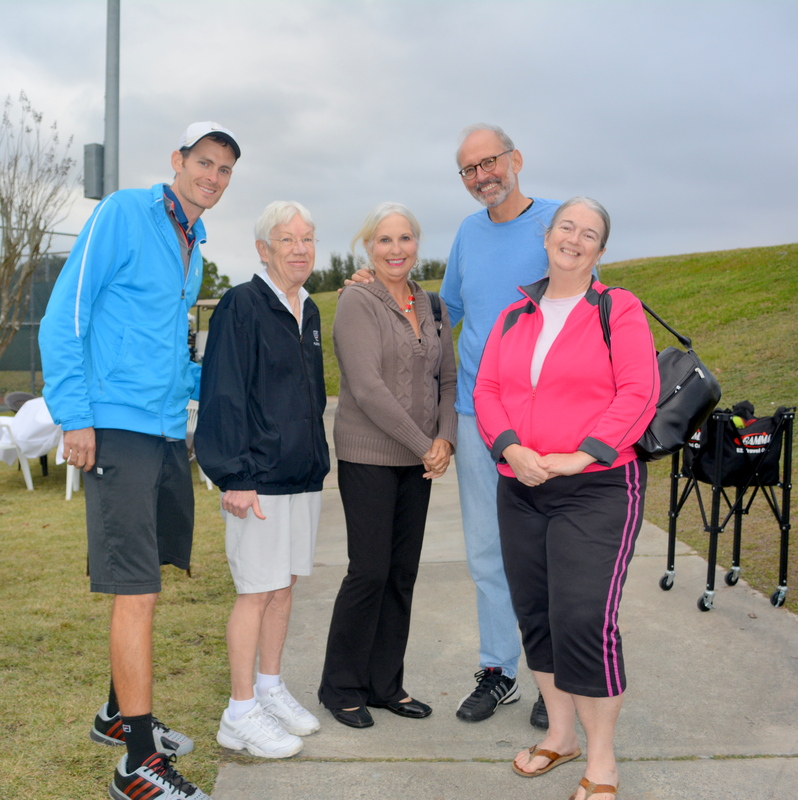 For more photos of the Community Tennis Clinic, click here. 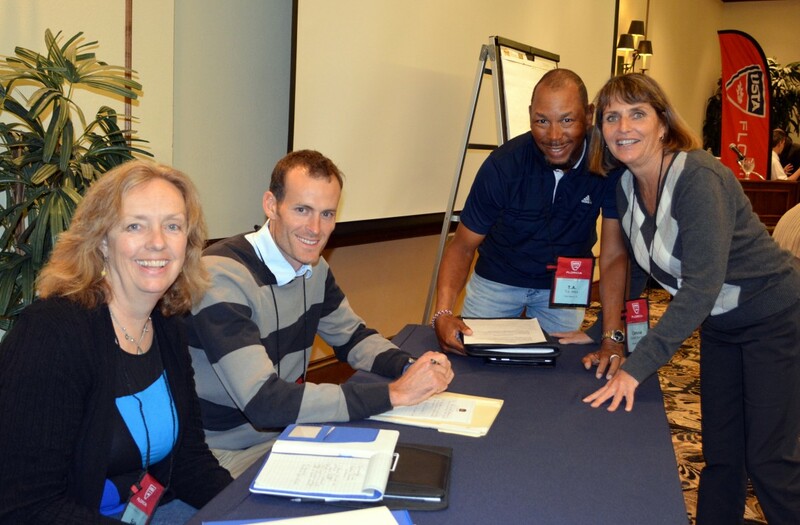 And to all our volunteers who have made our Middle School Tennis and Aces in Motion programs a reality, thank you! On Saturday, August 23rd, a morning community tennis event at DB Racquet Club and an Evening Celebration of Tennis were held to support the Gainesville Area Community Tennis Association’s Aces in Motion Tennis Outreach Program for at-risk children. 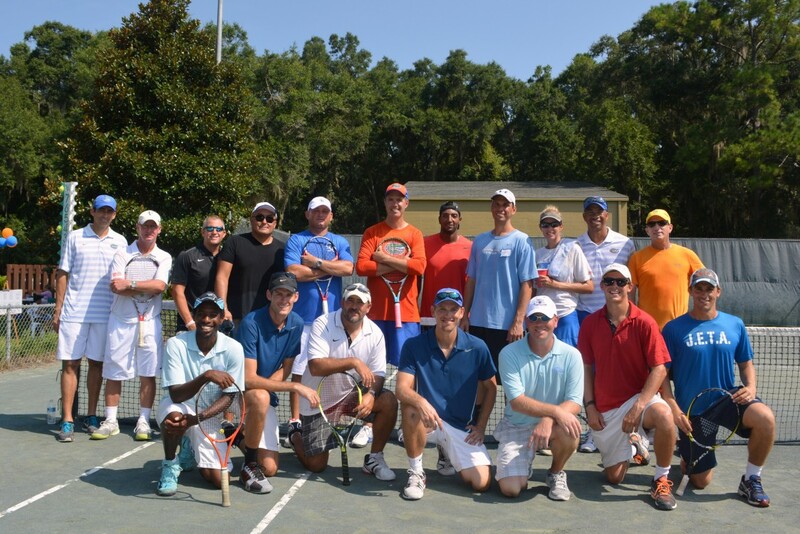 The fundraiser, the The Bryan Shelton Celebration of Gainesville Tennis, Past and Present, was very well received by the Gainesville tennis community. The morning and evening events both sold out, and approximately 200 people attended. 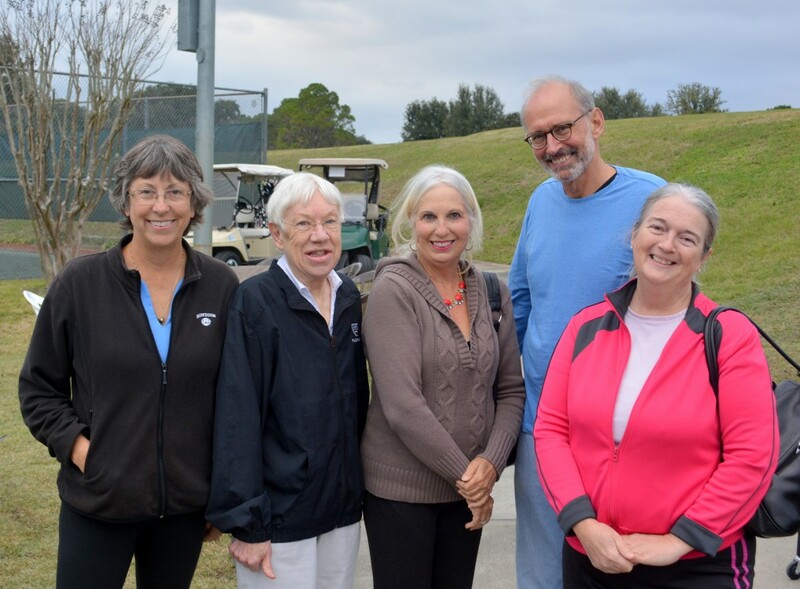 In a first for Gainesville, Don Blair of DB Racquet Club recruited tennis teaching pros from almost all the tennis clubs in town (including Fort King Tennis Center in Ocala) to come together and teach in the community tennis clinic. The UF Men and Women’s Tennis coaches also participated in the clinic, jumping on court along with tennis players from the community. Thanks to all the teaching pros who gave up their Saturday mornings to provide the “best Gainesville community tennis clinic ever”! Following the clinic, an exhibition was held, featuring Roland Thornquist, the UF women’s head coach and Bryan Shelton, the UF men’s head coach, who joined forces to compete against a former UF player, Chris McDonald and Tracey Smith Begley, a former FSU player. Players from the community were then randomly selected to join in friendly tiebreakers with Bryan and Roland. To end the morning session, Bryan Shelton shared his thoughts with the crowd on the importance of the Aces in Motion program. The evening event featured Bryan Shelton, program directors Addison Staples and Chris McDonald, and participants in the organization’s Aces in Motion program, as well as live music and a silent auction. 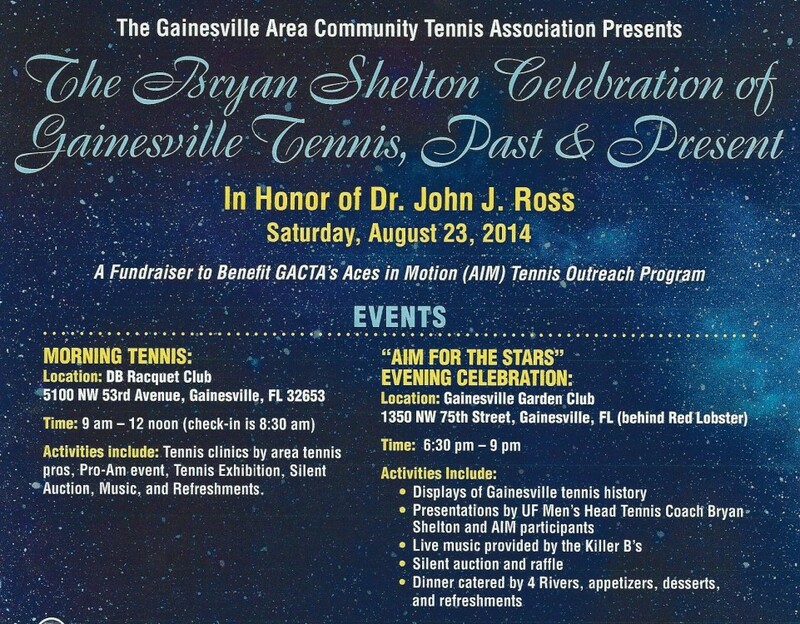 Attendees could also walk through a display of the highlights of Gainesville’s illustrious tennis history. As a part of the event, the Dr. John Ross Pre-Collegiate Scholarship was established, to honor the memory of Dr. Ross, a long-time Gainesville resident, beloved pediatric neurologist, and tennis advocate and enthusiast. 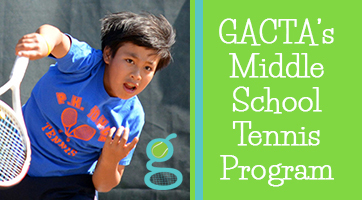 The fourth season of GACTA’s middle school tennis after-school program is starting up soon. The Gainesville Area Community Tennis Association is sponsoring the fourth season of its Middle School Tennis Program in Alachua County. The season is set to begin in April, 2014. In 2013, the program included eight private and public middle schools and approximately 140 students participated. The 2014 season will begin with practices in early April. Dual matches are planned to begin on Friday April 25th, and will continue through May. A tournament/play day will conclude the season. Participants will receive clinics from volunteer local tennis teaching professionals at local tennis facilities, and parents will volunteer to captain the each school’s team. Most matches will be held on Fridays, at various tennis facilities in the Gainesville area. A no-cut format will be used, and the program is aimed at players of all levels. The costs associated with registration are $45 for the season and include a team T-shirt, match balls and the end of season tournament/party. Transportation to and from the tennis facilities will be the responsibility of the parents. Scholarships are available. 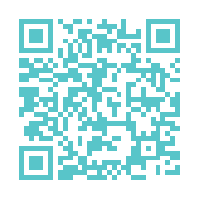 Use the QR code to share with your friends about the Middle School Tennis program! For more information, visit our Middle School Tennis web page or contact Anne Koterba, akoterba@nullaol.com or 352-665-9544. WUFT Evening News recently featured GACTA’s Aces in Motion program and its leader, Addison Staples, on the evening news. Watch the interview in the video below. The tennis community of Gainesville and surrounding areas rallied approximately 70 tennis advocates for a USTA Florida Community Tennis Workshop, “Growing Healthy Communities Through Tennis” on Saturday, Feb. 8, 2014 in Gainesville, Fla. The Gainesville Area Community Tennis Association is launching a pilot after school tennis program for middle school students in Alachua County. The inaugural season is set to begin in late March. Anne Koterba, vice president of GACTA, says the new middle school program will help introduce the lifetime sport of tennis to this age group and provide a positive recreational after school activity for students. Fort Clarke Middle School, Kanapaha Middle School, Westwood Middle School and Lincoln Middle School are the four Alachua County schools participating in the pilot middle school program. The season will begin with practices in late March. The schedule of five dual match weeks and one tournament week will extend from April 18th-May 27th, 2011. Participants will receive clinics from volunteer local tennis teaching professionals at local tennis facilities, and parents will captain the each school’s team. A no-cut format will be used, and the program is aimed at players of all levels. The costs associated with registration are $30 for the season and include a team T-shirt, match balls and the end of season tournament and party. Transportation to and from the tennis facilities will be the responsibility of the parents.